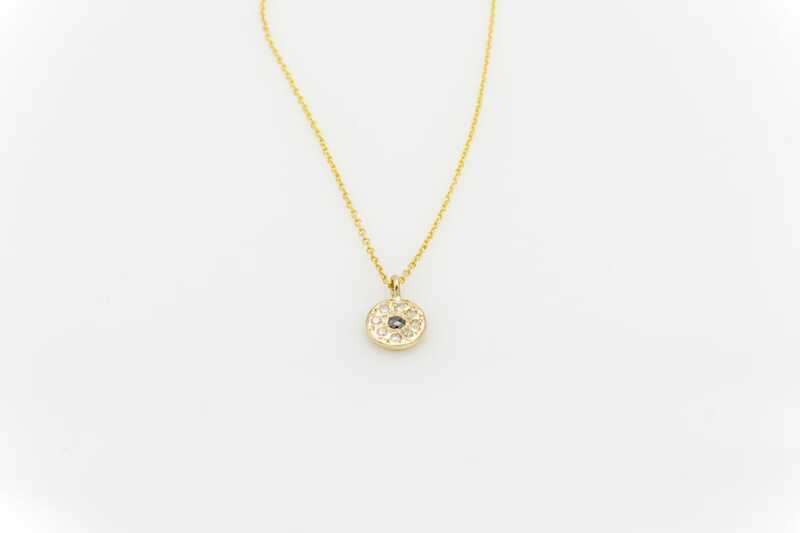 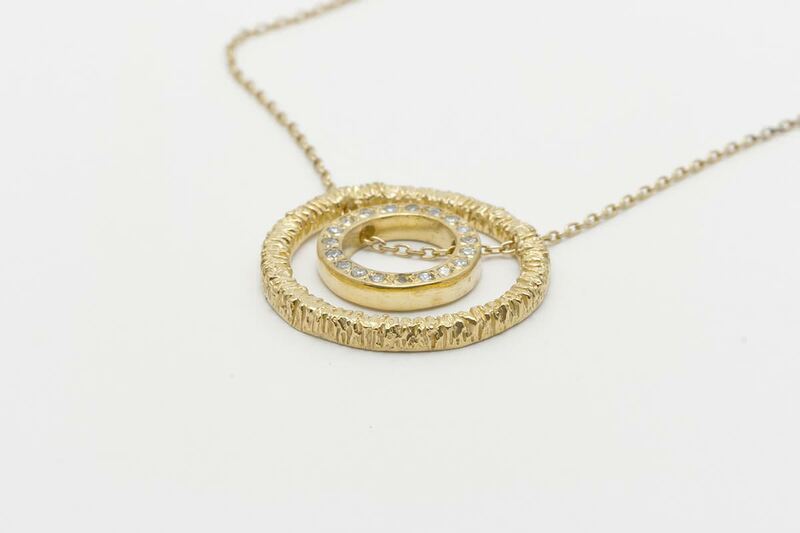 14k yellow gold small disk necklace, 5.3mm disk with a 1.5mm rose cut black diamond and 8 white diamonds (0.036ctw), 16-17in adjustable chain. 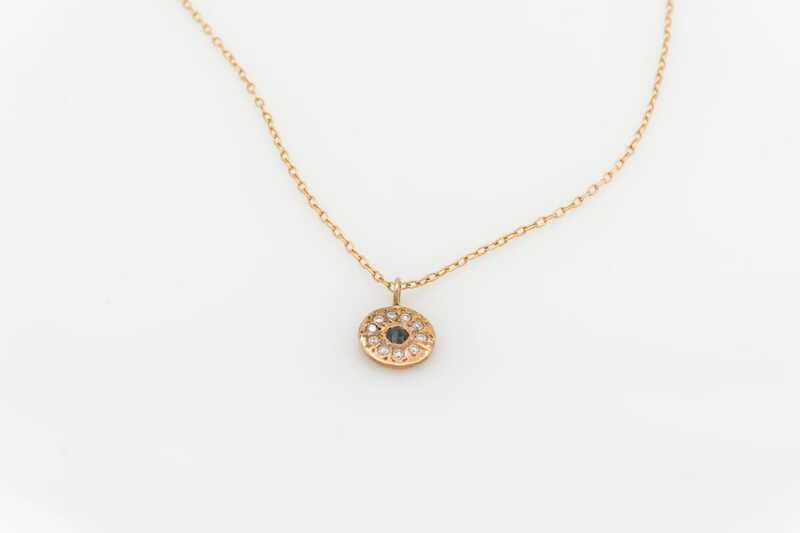 14k rose gold necklace, 7.0mm disk with a 2.3mm rose cut black diamond and 10 white diamonds (0.06ctw), 16-17in adjustable long. 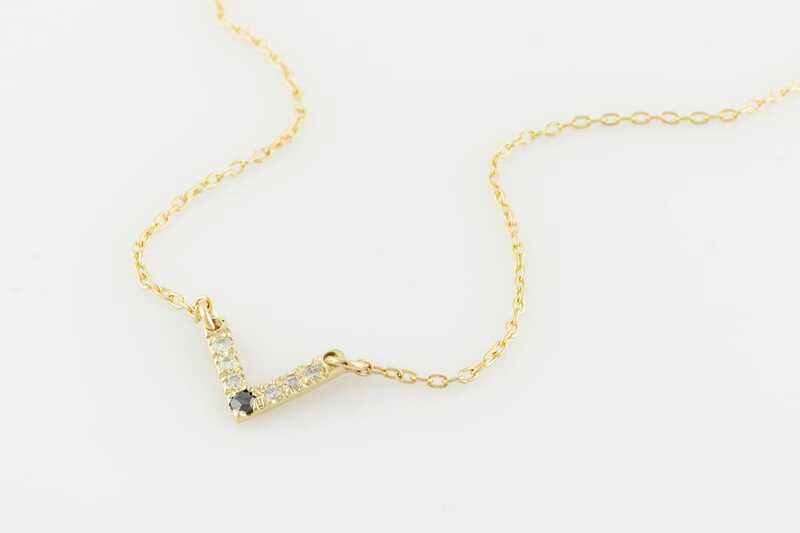 14k yellow gold necklace, 7.2x7.2mm v-shaped charm with 1.5mm rose cut black diamonds and 6 white diamonds (0.027ctw), 16in long. 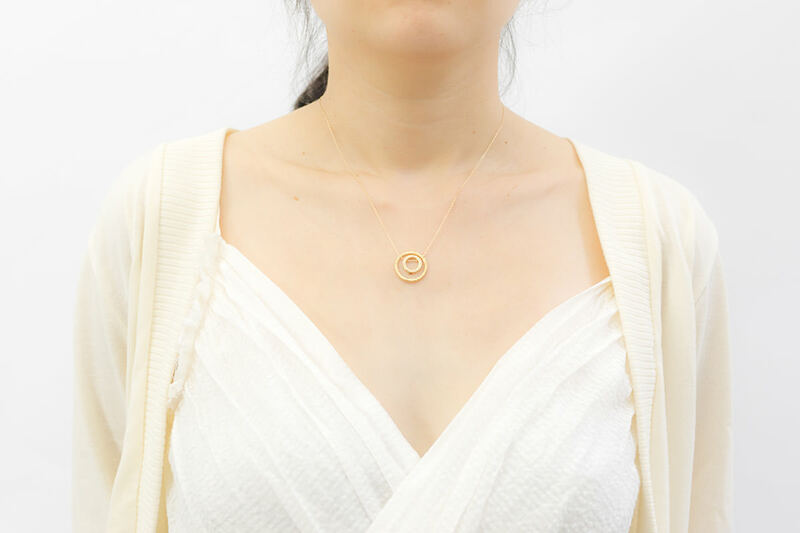 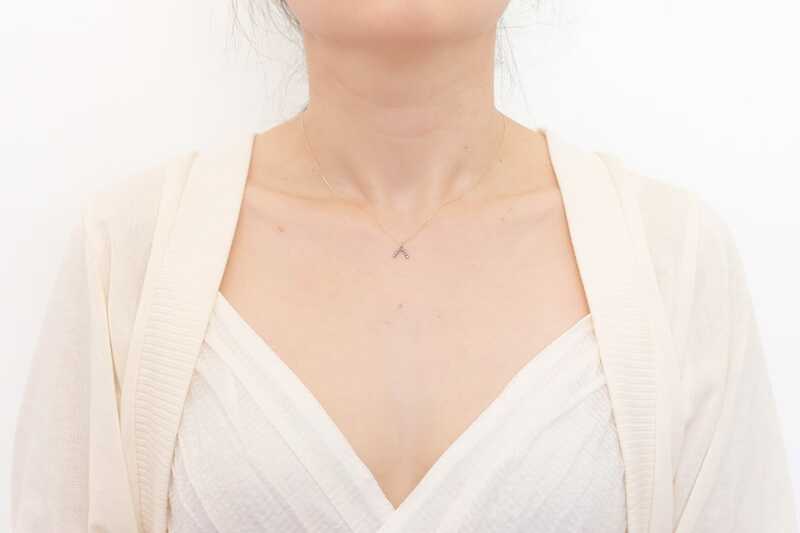 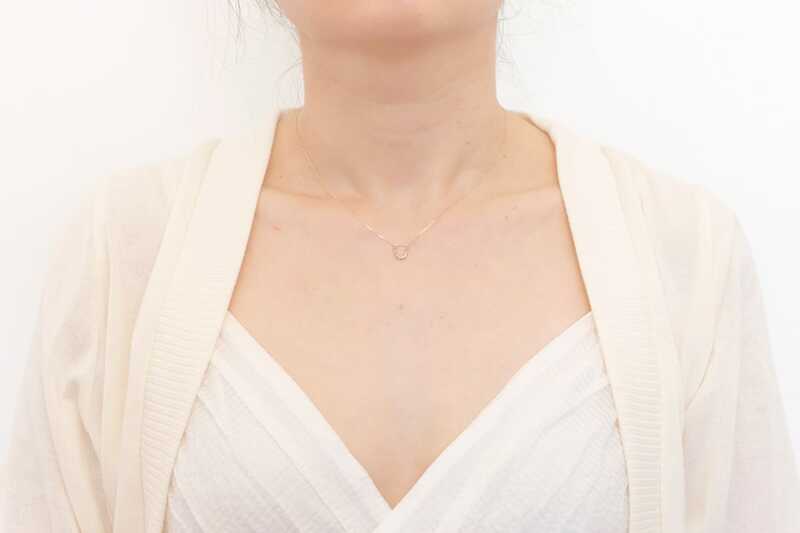 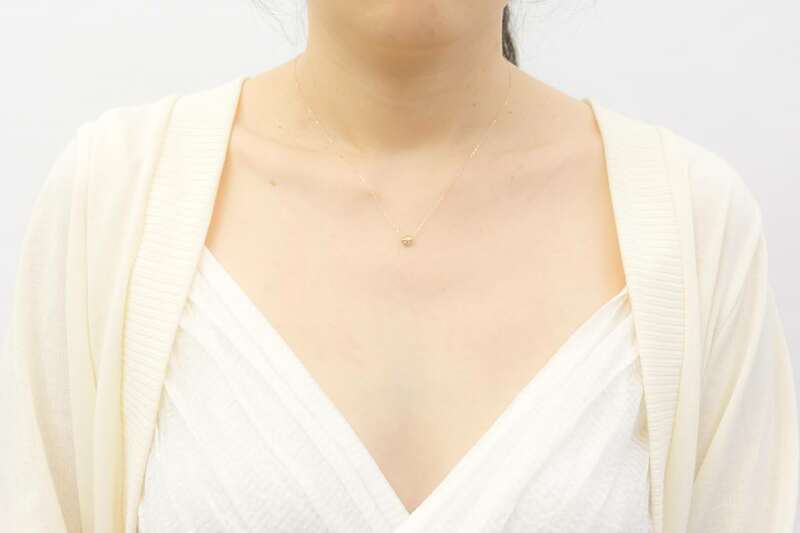 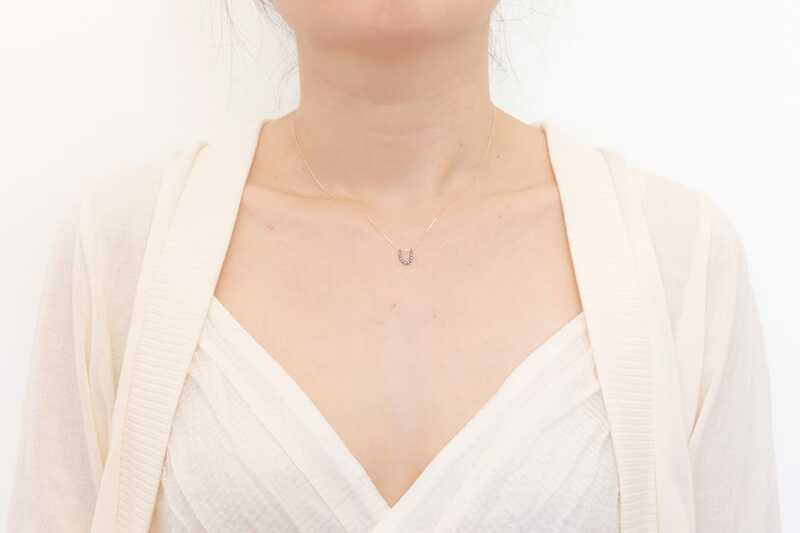 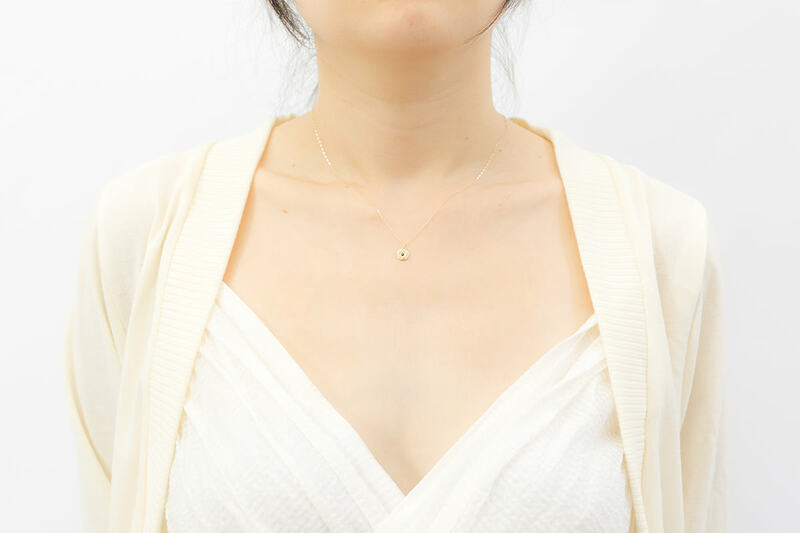 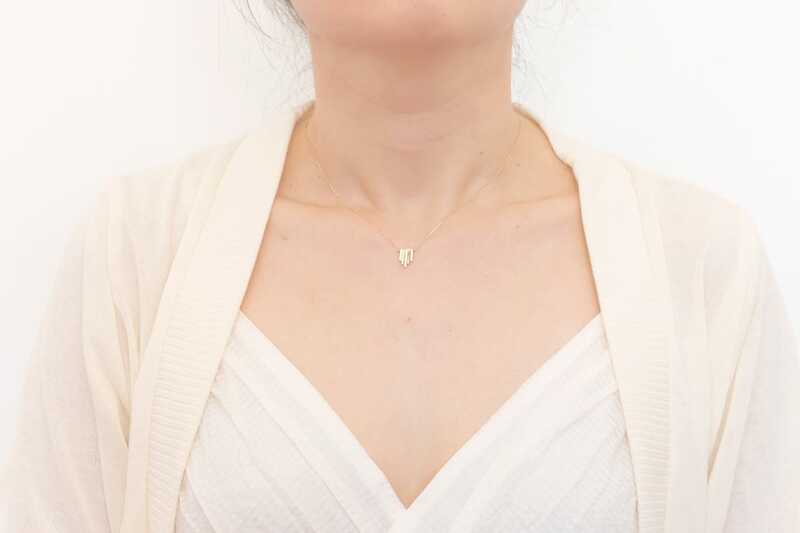 14k yellow gold necklace, inverted V-shaped pendant with 8 white diamonds (0.036ctw), 17” long. 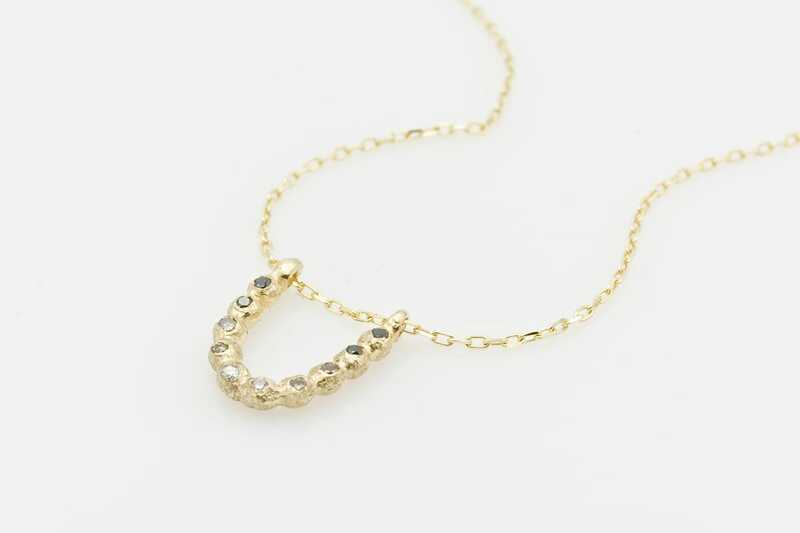 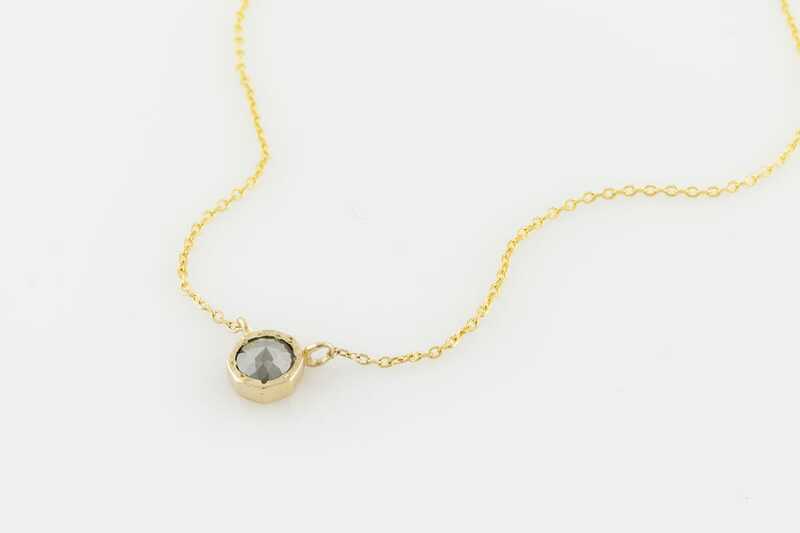 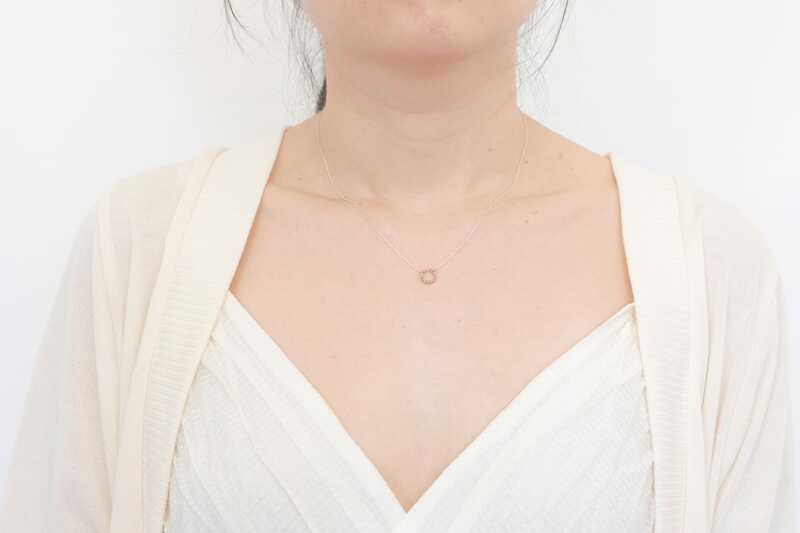 14k yellow gold necklace, 3.2mm rose cut grey diamond (0.14ct) on textured octagonal shaped bezel (approx. 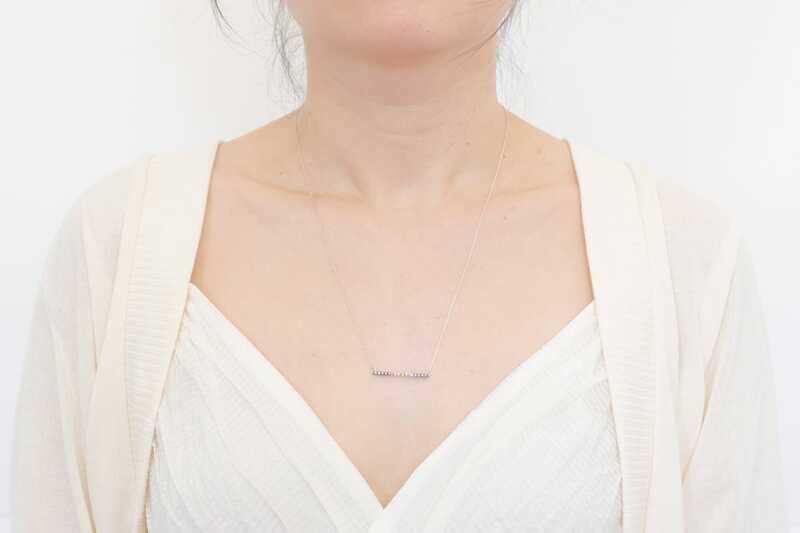 4.5x4.5mm), 17in long. 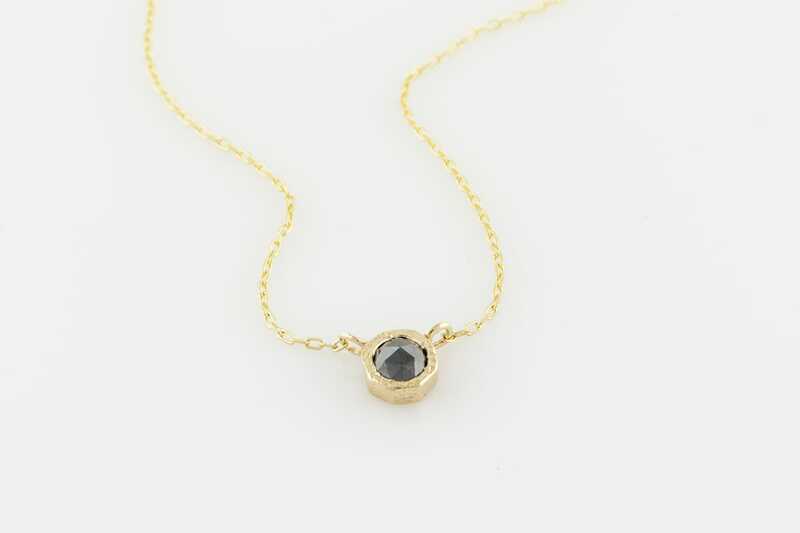 14k yellow gold necklace, 3.0mm rose cut black diamond (0.12ct) on textured octagonal shaped bezel (approx. 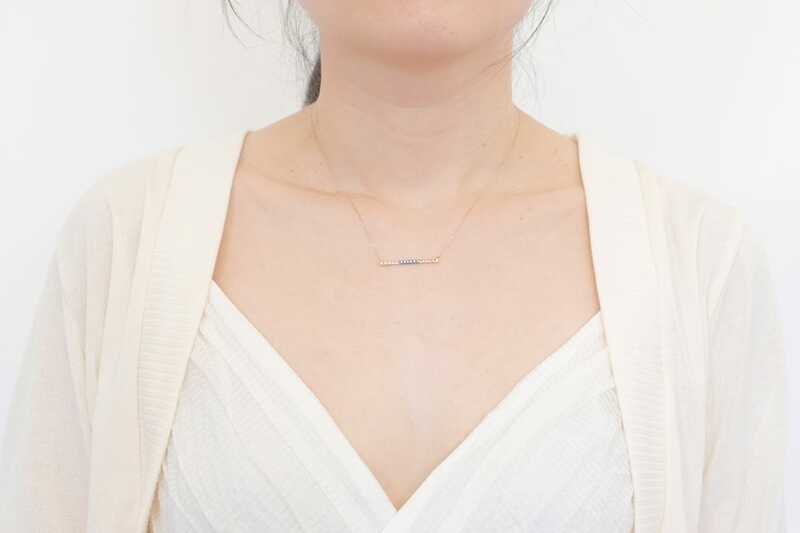 4.5x4.5mm), 17in long. 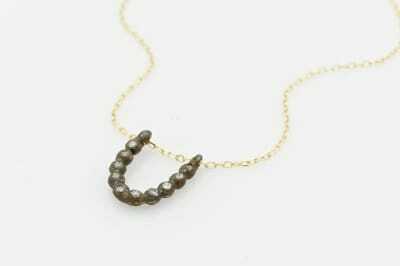 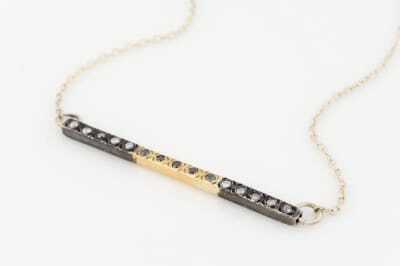 14k yellow gold necklace, lava textured bar pendant 10x7.0mm, with 2 black 2 brown 1 white diamonds (0.03ctw), 16in long. 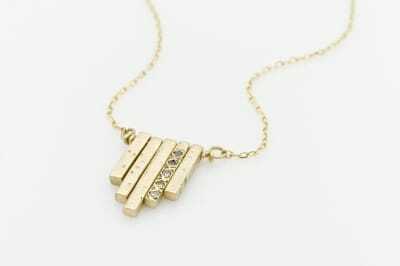 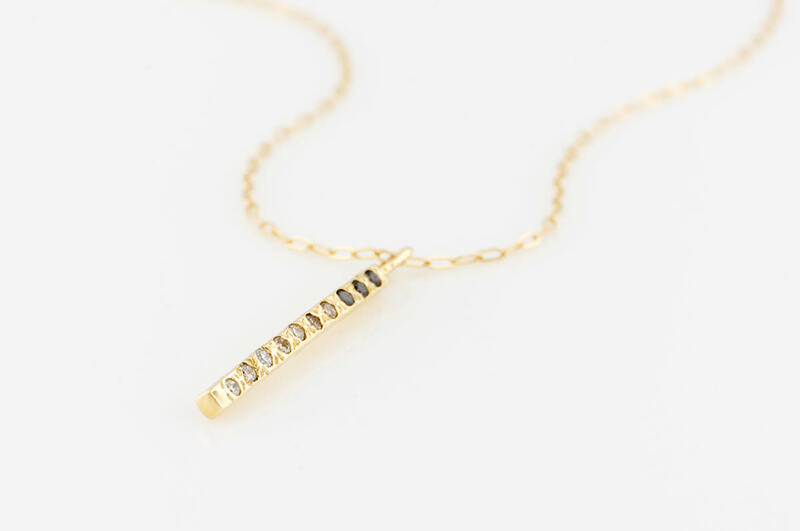 14k yellow gold necklace, 9x8mm U-shaped pendant with 4 black 4 brown 2 white diamonds (0.05ctw) each, 16in long. 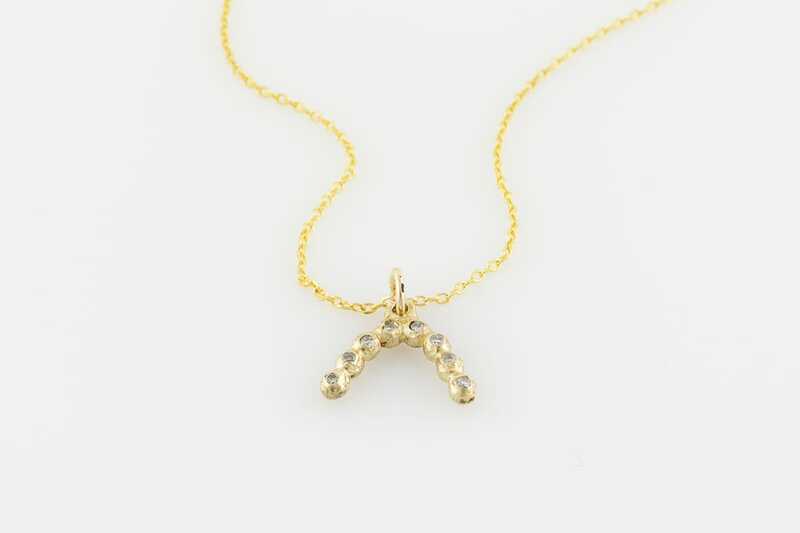 14k yellow gold and oxidized sterling silver necklace, 9x8mm U-shaped pendant with 10 single cut white-gray diamonds (0.05ctw), 16in long. 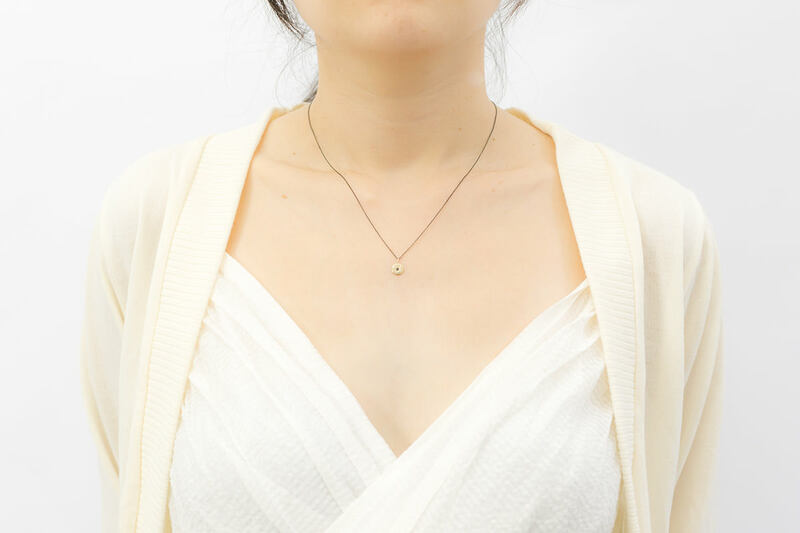 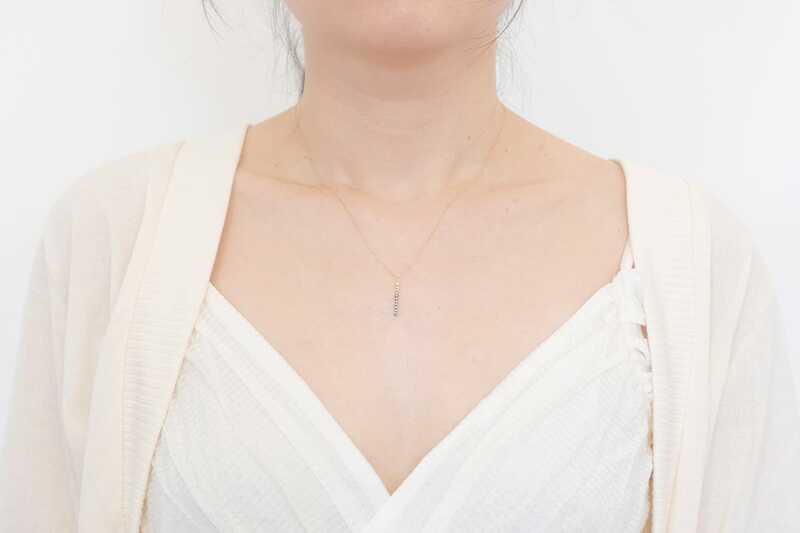 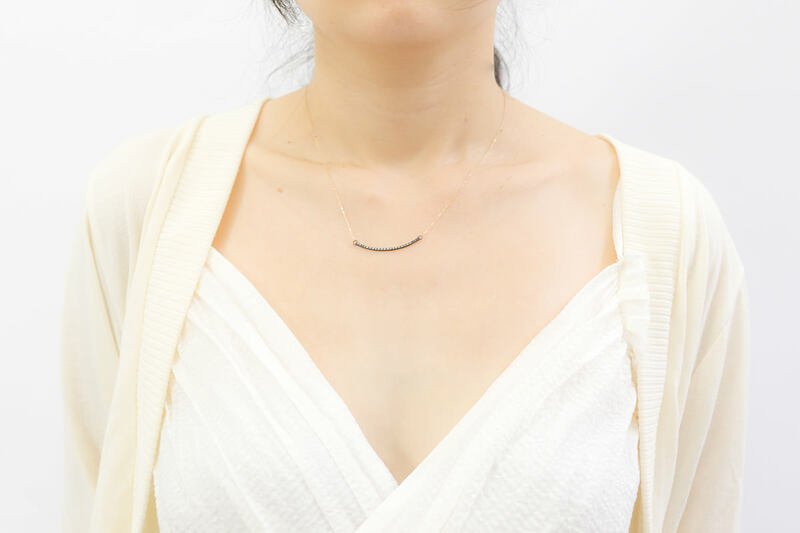 14k yellow gold and oxidized sterling silver necklace, inverted V-shaped pendant with 8 single cut white-gray diamonds (0.04ctw), 16in long. 14k yellow gold and oxidized sterling silver necklace, 19x1.2x1.2mm lava textured bar pendant, 3 black and 7 white diamonds (0.046ctw), 16-18in adjustable chain. 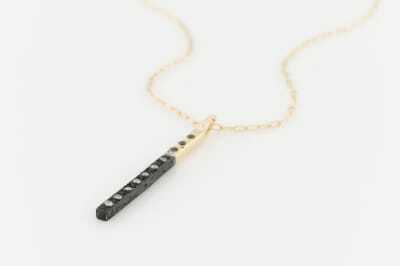 14k yellow gold necklace, 9.0x9.0mm pendant, 7 white and 7 black diamonds (0.063ctw), 17in long. 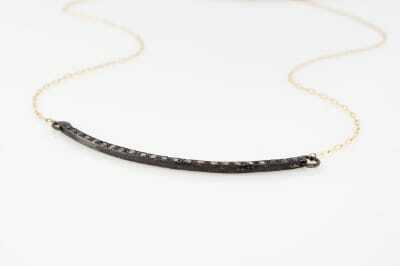 14k yellow gold oxidized sterling silver necklace, 9.0x9.0mm pendant, 7 white and 7 black diamonds (0.063ctw), 17in long. 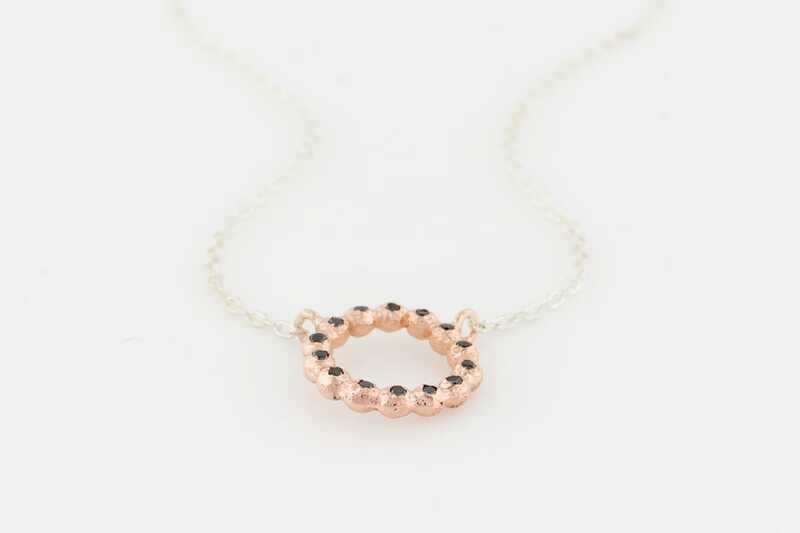 14k rose gold and sterling silver necklace, 9.0x9.0mm gold pendant, 14 black diamonds (0.063ctw), 17in long. 14k yellow gold and oxidized sterling silver necklace, 29x1.8x1.6mm lava textured bar,10 white and 5 white diamonds (0.09ctw), sterling silver chain, 22in long. 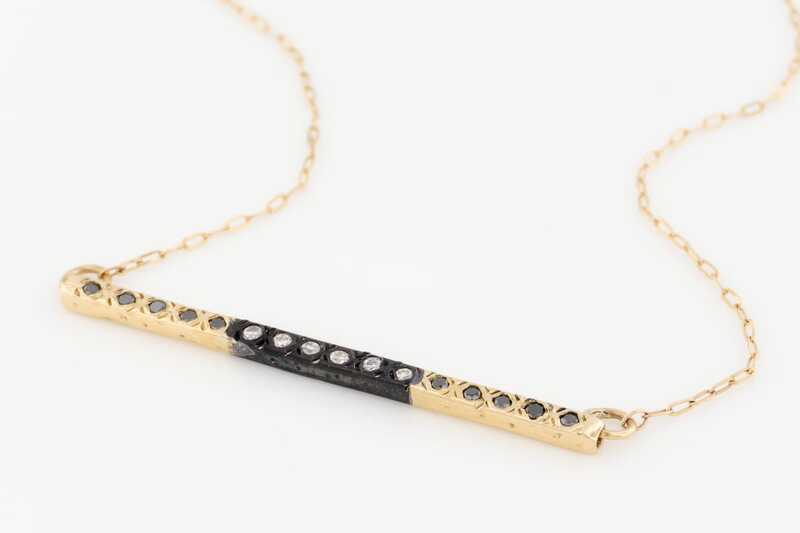 14k yellow gold and oxidized sterling silver necklace, 31x1.8x1.6mm lava textured bar,10 black and 6 white diamonds (0.09ctw), 14k yellow gold chain, 16.5in long. 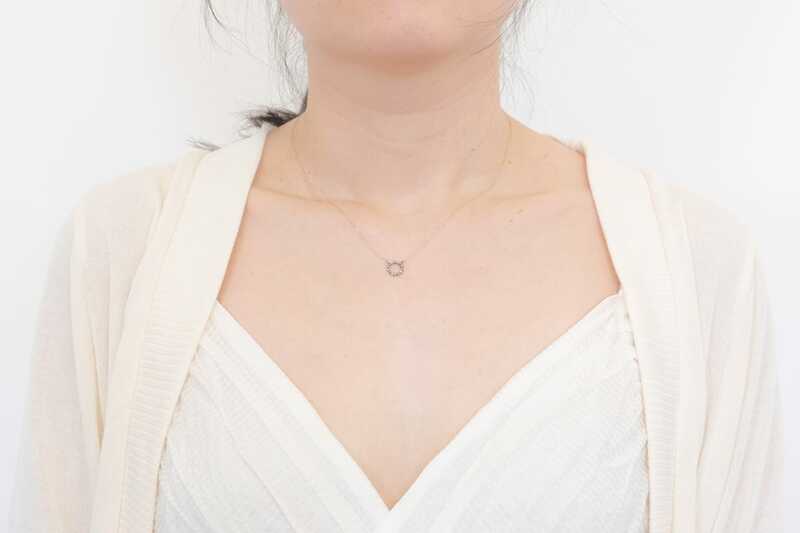 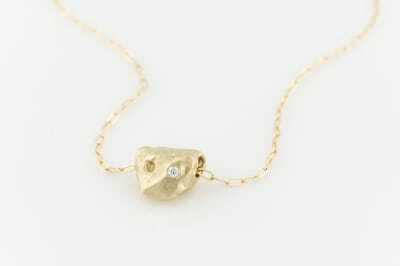 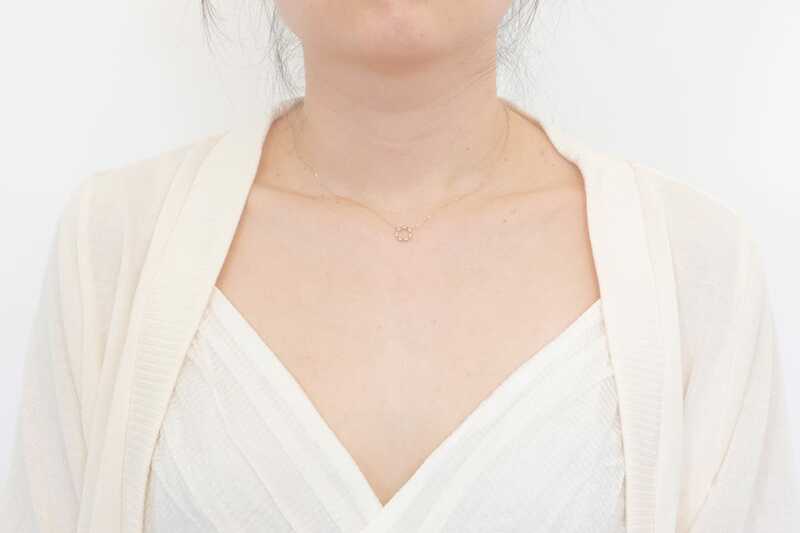 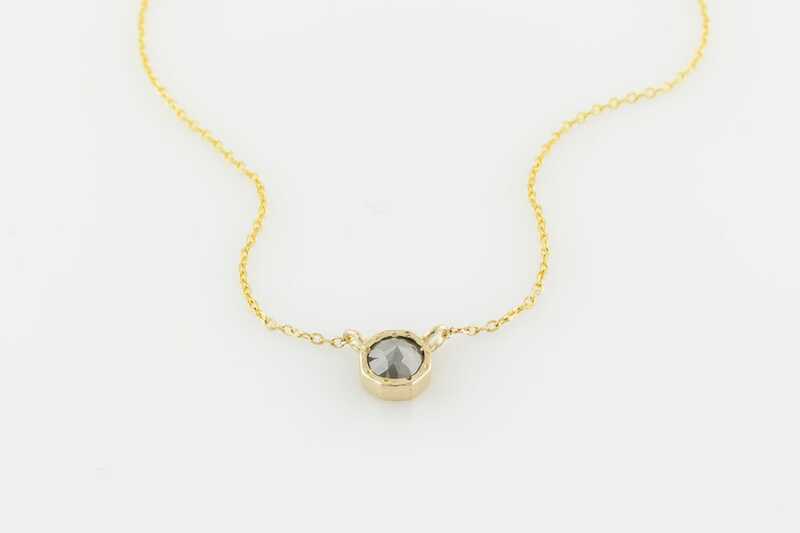 14k yellow gold lava necklace, one white diamond(0.0055ct), 16-18in adjustable chain. 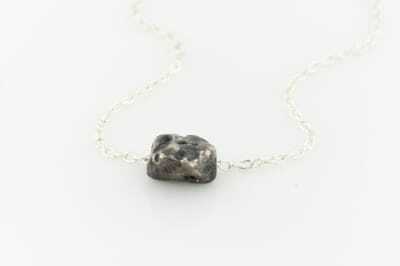 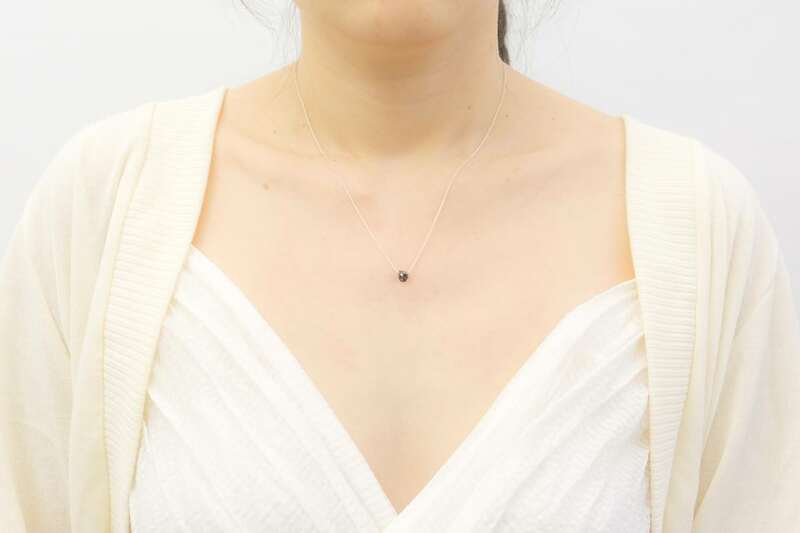 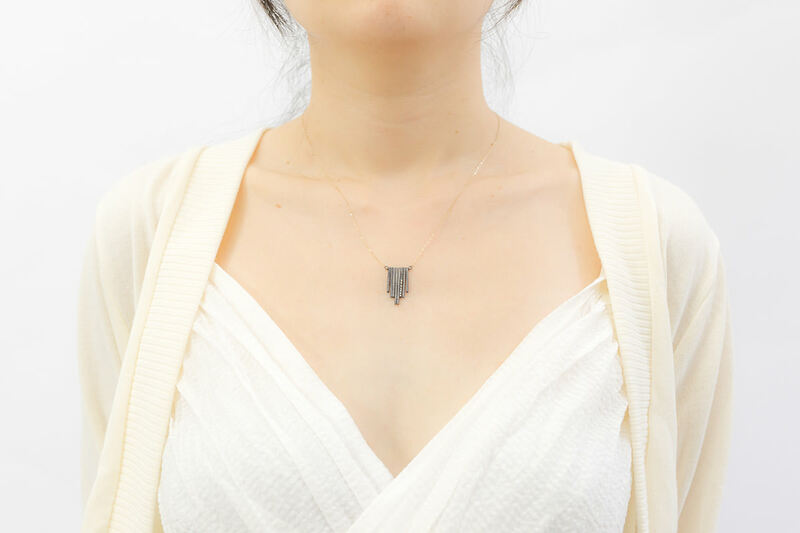 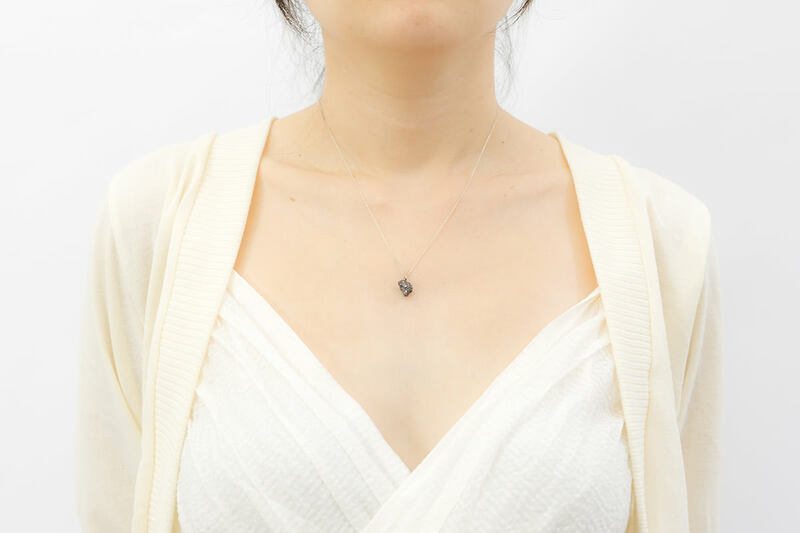 Oxidized sterling silver lava necklace, one white diamond (0.005ct), 16-18in adjustable silver chain. 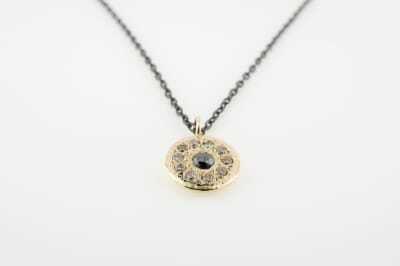 14k yellow gold, 17x1.2x1.2mm pendant with 3 white, 4 brown, 3 black diamonds (0.05ctw), 16-18in adjustable chain. 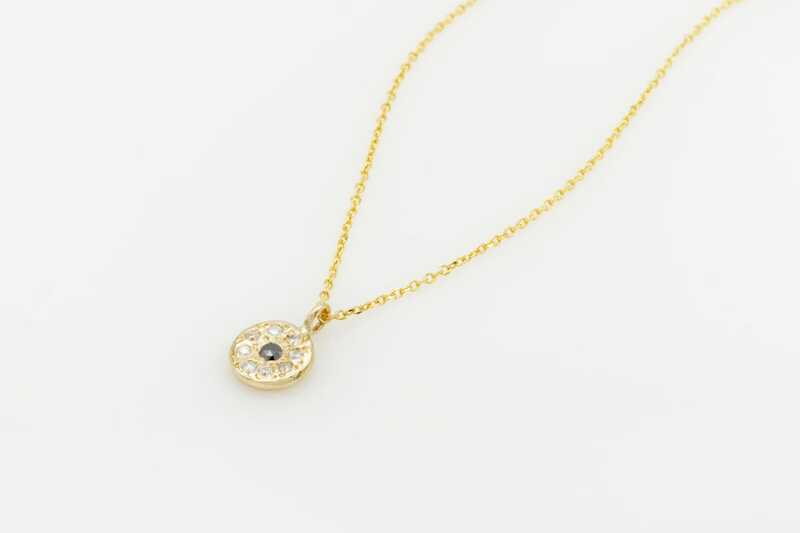 14k yellow gold, 7.0mm diameter disk pendant with 2.3mm rose cut black diamond and 0.07ctw brown diamonds, 16-18in adjustable chain. 14k yellow gold chain, 1.5in (38mm) long oxidized sterling silver bar, 5 white, 12 brown, 6 black diamonds(0.14ctw), 18in long. 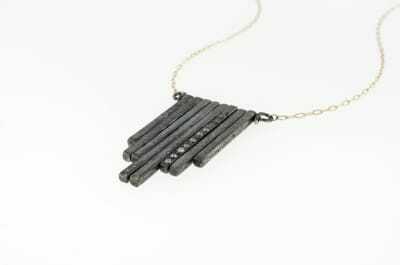 14k yellow gold, Oxidized sterling silver, 22x9.6mm pendant tops, 3 white, 4 brown, 3 black diamonds (0.052ctw) 18in yellow gold chain. 14k yellow gold and oxidized sterling silver necklace, 7.0mm diameter disk pendant with a 2.3mm rose cut black diamond and 0.07ctw brown diamonds, 14k yellow clasp, 16-18in adjustable chain. 14k yellow or white gold, 0.1ctw white diamonds, large circle measures 3/4in, small one 10mm diameter, 16-18in chain. 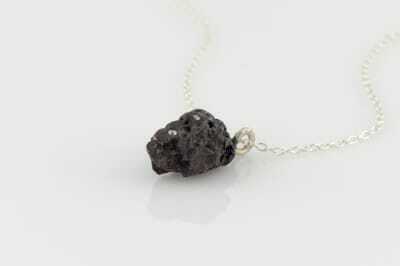 Oxidized sterling silver lava charm, 3 white diamonds 0.015ctw, 16-18in silver chain.